Today we are continuing our blog series on slatwall displays. We’ll explore more examples of how you can make your slatwall display more interesting and exciting while continuing to leverage the utility and universality of these ubiquitous retail store fixtures. If you missed Part I in our series, it’s worth taking the time to check it out here. 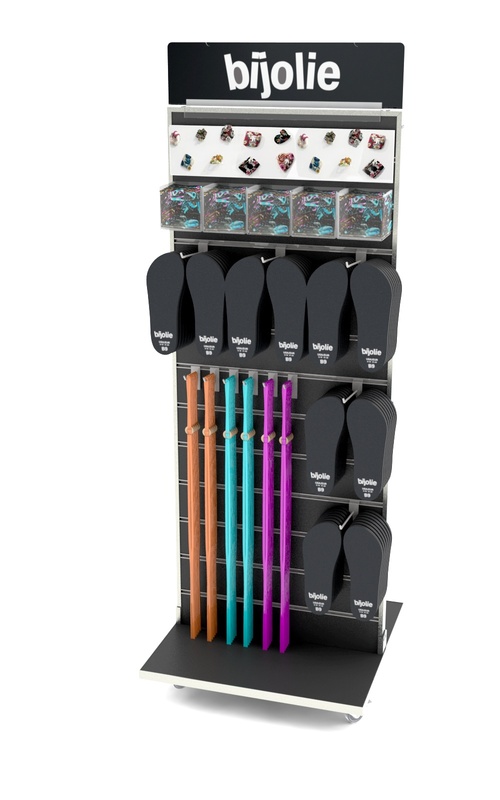 We’ll start out today by showing a few examples of how our stock 2-sided slatwall display (SW-62FL) can be customized to help your product stand out at retail. 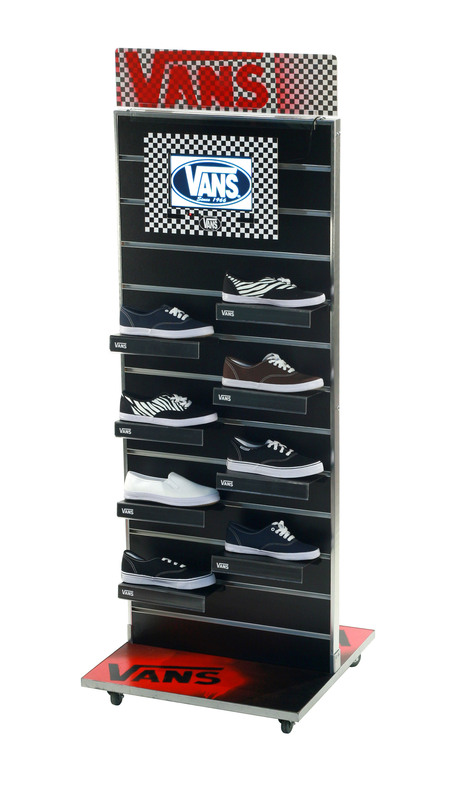 The picture below shows how we created a cool footwear merchandiser out of a fairly generic freestanding slatwall display. We added branding to the slatwall shoe shelves and added stenciled graphics to the base- the kind of graphics that would appeal to skateboarders or who someone who is inclined to wear Vans. We then added a digital media player which featured very hip video content and included a custom frame around the video screen that tied in with the header we added. The result was a well-branded and interesting slatwall display that could capture shopper attention. Our second example is a spinning bamboo pinwheel slatwall display that we made out of carbonized edge grain bamboo which we clear coated to bring out the natural beauty of the bamboo material. 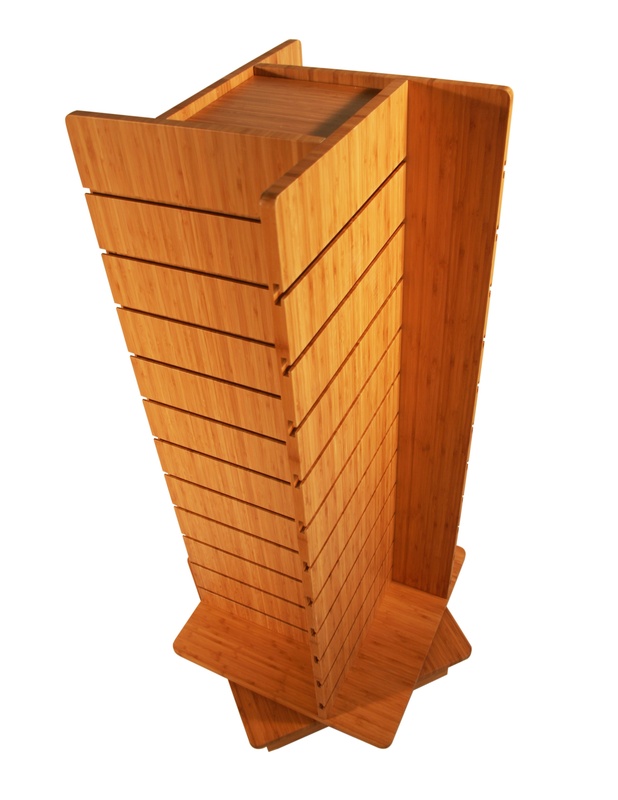 In addition to the inherent space efficiency of the pinwheel design, this display offers all of the sustainability benefits for which bamboo is known. Some species of bamboo grow nearly 4 feet in a 24- hour period so bamboo is one of the most eco-friendly materials one earth. It is also incredibly strong and durable so there is no need for aluminum or metal slat extrusions since there really is no risk of the slat channels chipping. In addition, the edges of bamboo do not need to be finished since 3-ply bamboo is visually interesting. Another example of a pinwheel slatwall display is one we did for SIGG to merchandise water bottles as shown below. On this display, we used MDF with a wood melamine finish, matching edge banding, and aluminum slat extrusions. We created modular sheet metal bottle hangers, added casters and a branded vacuum formed base, and then topped off the display with a 4-sided, screen-printed aluminum header. Many retailers have entire wall sections made of slatwall. Using walls is a great way to preserve floor space, and slatwall is a great solution since you can hang virtually anything on it. Slatwall does not make for the most interesting backdrop so creating a slatwall display that covers up the slatwall is typically your best bet. 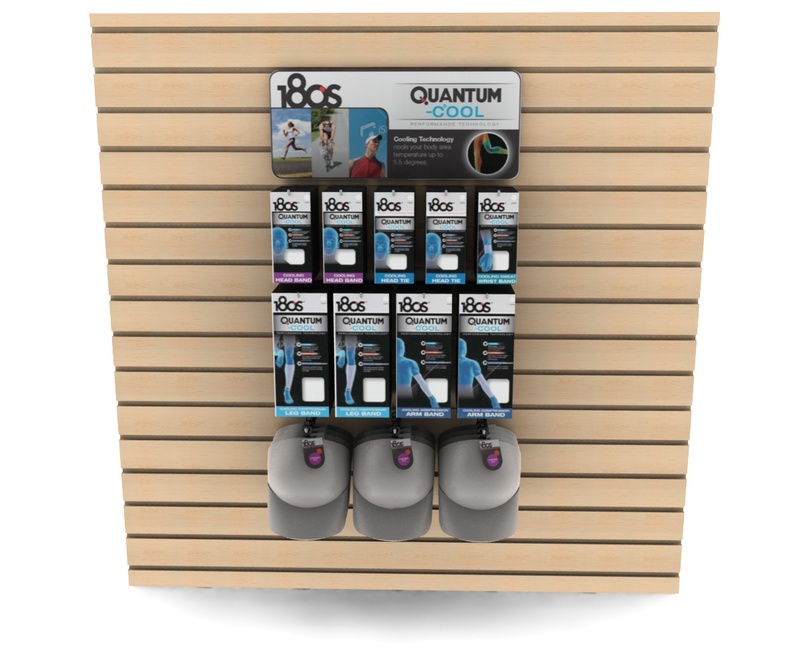 The example below shows the Quantum Cool display we designed for 180s. It has a separate hanging header and then 3 tight rows of hanging product below it. This design creates a well-branded integrated presentation that completely hides the slatwall and puts your focus on the product. Our next example shows how it is possible to use a 2-sided slatwall display like our SW-62FL and create a nice merchandising presentation with little or no customization. Our customer’s product fit really well on this 24” wide display. In addition to adding the header sign, the only thing we had to do was add the white info graphic sign that sits below the header. 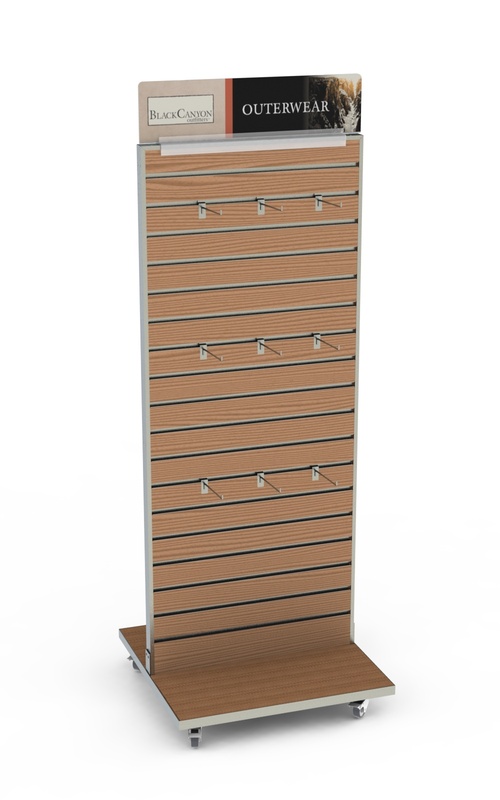 When fully merchandised, it is difficult to tell this is a slatwall display. Our sixth example is another 1-sided slatwall display that is difficult to recognize as a slatwall display when fully merchandised. For this Craft display, we started with a basic slatwall display and designed individual metal shelf trays with clear acrylic front lips and sides to maximize product visibility. The only other branding we did was to add a simple header. 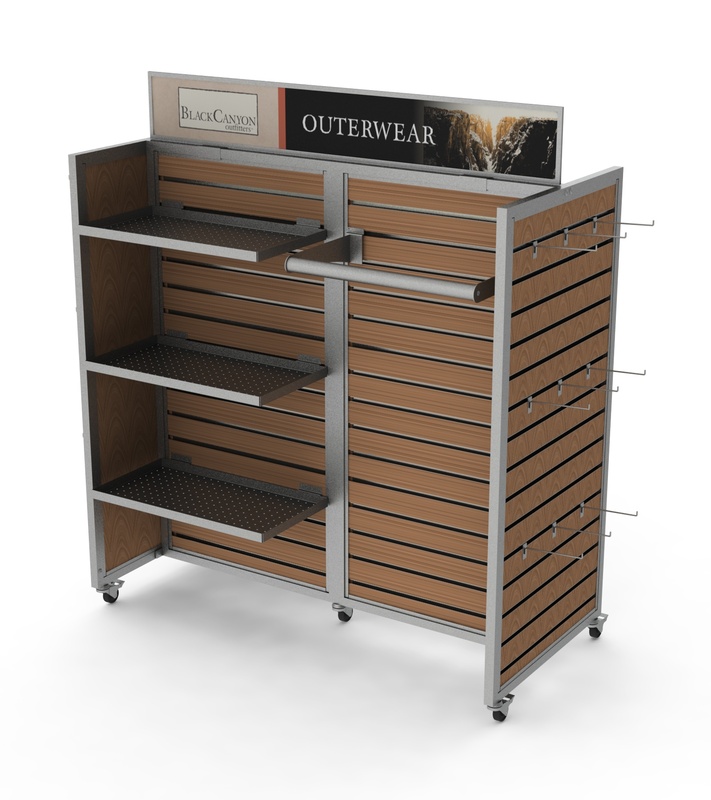 The metal shelf trays could be used on this freestanding display and also on slatwall wall sections in stores. 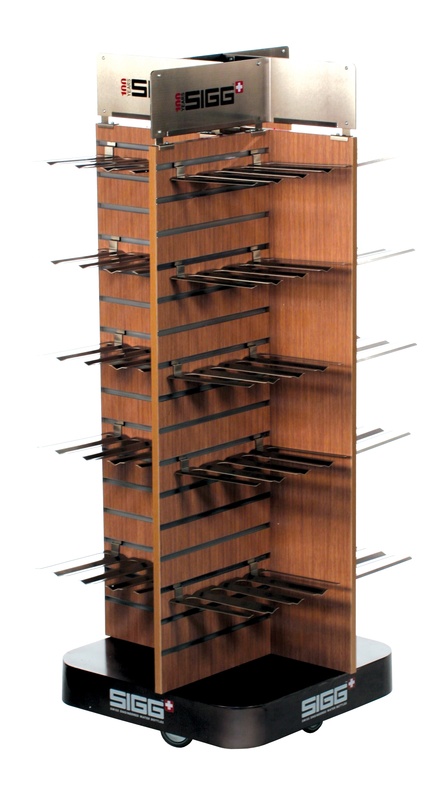 Our last two examples for today are designed to be part of a family of slatwall fixtures for Black Canyon Outerwear. We designed these two fixtures to create a natural look and outdoor vibe. There is really nothing unique about the structure of these two units since they are similar to our stock slatwall displays. What makes them different is the stained solid wood slats. Since we used solid wood we eliminated the aluminum or metal extrusions which helped to create a more natural look. These two examples also show how easy it is to make slatwall displays configurable by using a variety of slatwall accessories such as hooks, shelves, apparel bars, faceouts, waterfalls, baskets, etc. Both displays also have simple but effective header graphics. Don’t miss Part III of our blog series on slatwall displays where we will continue with many more examples that can help you avoid the trap of merchandising your product on boring slatwall displays.